Still no good. Even with SP1 installed and everything disabled. I have no antivirus program installed. Last edited by CookyMonzta; 02-03-2012 at 01:47 PM. Are you using the latest bios version available from the ASRock website? Before you try to update win7, have you checked that windows Defender and Firewall are configured and working? "Standard Conexant 56K fax modem in the PCI slot (No phone wire connected)"
and you are trying to use your DSL modem for internet access. Maybe their is some type of incompatibility with both of these connected. mouse, keyboard, one hard drive, one optical drive, etc. I don't see a video card in your hardware list, so I assume that you are using integrated graphics. I suggest that you send a PM to ASRock TSD - Emily, include a link to this thread and ask her to take a look. Last edited by profJim; 02-03-2012 at 01:43 PM. According to my ASRock Extreme Tuning Utility (AXTU), my BIOS is showing P1.00 (which one, I don't know), 07/29/2011. ASRock has 3 version 1.00 BIOS files: Instant Flash, DOS and Windows, all 08/03/2011. I am uncertain as to which one I should use. I had the Conexant modem installed in my AMD machine with the same Win7, and I had no problems with the updating process. My cable is plugged into the motherboard's RJ45 outlet and I have the same DSL modem from my previous build. Never mind. There's a method for each one. Instant Flash can be executed in the UEFI. It's all well and good that your hardware worked with your AMD system, the point is that you're having repeated problems with your current system. Sometimes brand new systems have problems where the system can't even post. In some cases, we recommend that they perform a minimalist boot where they eliminate ALL HARDWARE THAT ISN'T REQUIRED to boot. In your case, your goal is to install and update win7 as an initial step. Then you can add hardware and software one at a time until the problem reoccurs. This approach can help identify where the problem is. For all we know, the problem might be related to your bios settings, cpu, or memory. I've seen other ASRock threads where Emily will provide a beta bios to see if that will fix a problem. ASRock tech support probably can't try to duplicate your problem because they probably don't have access to identical hardware. "L1.00C 1/12/2012 Instant Flash 3.07MB Improve keyboard and mouse compatibility under BIOS"
but I wouldn't try this version unless Emily suggests that you do. I'm almost down to the bare bones, and the PCI modem is out as well. Error 8024402F is still there. Did you plug the DSL modem in dire ctly to the RJ45 jack? or is it plugged into a router? or does your modem have a built-in router? If it is built in, try resetting the router by holding down the reset button for 30-seconds and it will force a clear cmos and it will load system defaults. Routers sometimes have a feature to block activex as well. also, do the same with your motherboard. set the clear cmos jumper for at least 1 full minute, or 10-minutes for safety's sake. ps. are you able to get online fine, well without updates anyway? Get email, visit web sites, etc. No router plugged in. The DSL modem is plugged into the RJ-45 jack. I get nothing from Windows Update except the error. Only the front page of MSN pops up on IE, and absolutely nothing else beyond that. I have no problem with the DSL modem itself, because it works perfectly when I use it with my laptop. Unless I overlooked something really bizarre, from any of my other hardware or the motherboard itself (because none of the solutions work, from what I have seen so far on the Web), I will have to strip the rest of my machine and rebuild, and quite probably, have the board replaced. Last edited by CookyMonzta; 02-04-2012 at 01:11 PM. So you cannot visit any other sites onlines, except MSN? Google doesn't work, this site doesn't work, ect? It's a network connection issue, not hardware, so you don't need to start thinking about replacing things. I have dealt with this issue many times, and it's always a random fix that corrects it, you have to try all the various network related fixes via googling that error number. For the easiest one, did you try adjusting the internet connection setting to use a proxy or not? 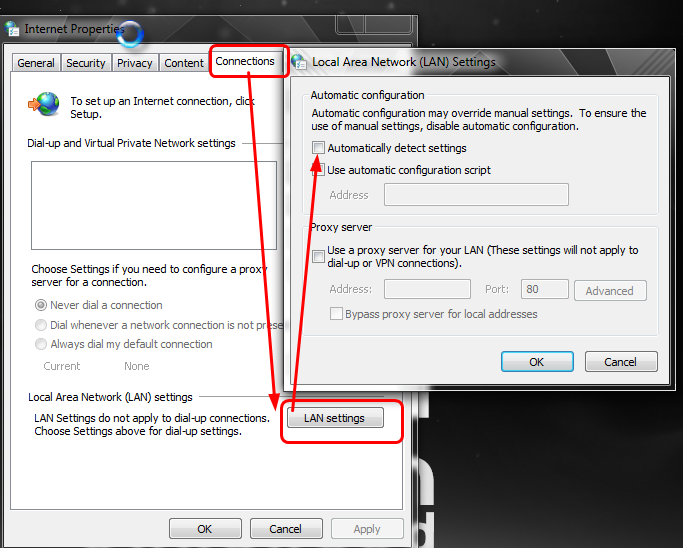 Internet connections in control panel, then connections, then LAN settings, then try with nothing checked in that box and then try with automatically detect? That is the easiest method to try and fix, but it's usually something else that fixes it but that's what you should try first. Been there and done that, 3 times, with the boxes checked, unchecked, or a combination of the two, with and without my firewall active.